During last year’s outdoor Heps, Princeton’s Meghan Curham won both the 5,000m and 10,000m races. This year, Curham is finishing up a year off from school, so there will be a new champion in both events. 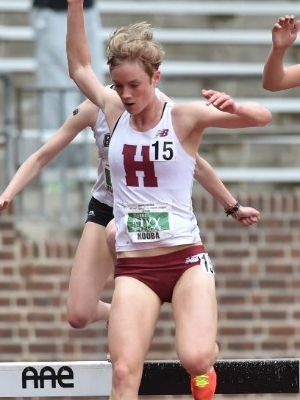 Harvard sophomore Courtney Smith hasn’t run the 5K yet this season, but she will be a favorite to win if she enters. Princeton senior Emily de La Bruyere has the fastest seed time in the conference, 16:04.19. de La Bruyere could double up in the steeplechase and 5km as she did last year, however, it may be tougher for her to pull off. Five other women have run under 16:20 this season, and many of them are Heps veterans. Penn junior Ashley Montgomery (#2 seed, 16:08.64) is also a contender in the 1,500m and focused last year on that event and the relays. Penn junior Cleo Whiting (#3 seed, 16:14.35) was third in 2015 at outdoor Heps in the 5K and fourth indoors in the event. Cornell senior Caroline Kellner (#4 seed, 16:18.17) is a perpetual Heps scorer and is running great this season. Columbia junior Henna Rustami (#5 seed, 16:18.87) has lowered her PR by 25 seconds this season in this event. 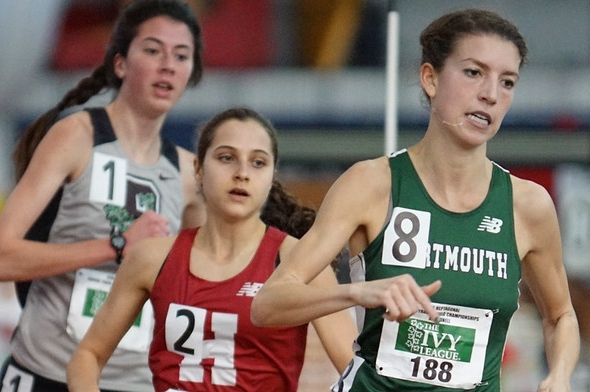 And finally, you can never count out Dartmouth senior Dana Giordano (#6 seed, 16:19.65), who is coming off 3K/5K double at indoor Heps where she won the shorter race and placed third in the 5K. Last month, Smith ran 32:08.32 for the 10,000m at the Stanford Invitational, establishing a nearly three-minute PR and both school and Ivy League records. Smith, who qualified for the upcoming Olympic Trials, is currently ranked #2 in the NCAA in the event. Should she choose to compete in the 10K at Heps, she is certainly the favorite. Cornell’s Kellner (#2 seed, 33:51.94) ran close to her PR the one time she competed at the 10K distance this spring and has since posted a swift 5,000m time as well. Kellner was second outdoors last year in this event and scored in both the 3,000m and the 5K indoors at Heps. Princeton senior Kathryn Fluehr (#3 seed, 34:29.59), Harvard sophomore Elianna Shwayder (#4 seed, 34:40.83) and Columbia junior Pegah Kamrani (#5 seed, 34:43.88) should be in the hunt second and third places. Fluehr was sixth last year at outdoor Heps in the 10K and Kamrani was 10th, but has improved her PR by almost two minutes this season. Harvard’s Paige Kouba is on fire this season in the 3,000m steeplechase. At the Stanford Invitational in March, Kouba ran 9:50.21 — a school record and the second fastest time Ivy time ever. Kouba qualified for this summer’s Olympic Trials with that time, and it is the fourth fastest mark in the NCAA to date. Kouba was third in steeple at last year’s Heps, and she certainly the favorite to win it this year—maybe breaking Alexi Pappas’ championship record of 9:58.80in the process? Princeton senior Emily de La Bruyere, fifth at last year’s Heps, has also posted impressive times in the steeple this season. She ran 10:06.26 (#7 all-time Ivy, currently #17 in the NCAA) at the Larry Ellis Invite and could battle with Kouba for the win. Others who could contend for the win and certainly the podium include Penn senior Amy Darlington (#3 seed, 10:20.41), who has improved her steeple time by eight seconds this season and Princeton senior Alexandra Markovich (#4 seed, 10:24.24), who ran 34 seconds faster at Larry Ellis than she did in the beginning of the 2016 season! Of note, Princeton junior Elizabeth Bird and Brown sophomore Natalie Schudrowitz, the defending champion and runner-up in the steeplechase, have both yet to compete in the event this season. This entry was posted on Tuesday, May 3rd, 2016 at 11:00 am. It is filed under Heps Champs, Spotlight, Team Previews, Women. You can follow any responses to this entry through the RSS 2.0 feed.